Ambassadors from various countries carrying out their duty in Turkey shared the stories of their long and bumpy journey to learn Turkish in the pursuit of understanding Turkey and connecting with local culture. "Turkish is not an easy language. But I am trying [to learn it] to be able to feel closer to Turkish [people]," Japanese envoy Akio Miyajima told Anadolu Agency (AA). Pointing out that Turkey and Japan are of one heart, Miyajima stressed that although the two countries are very far away from each other geographically, the hearts of the people from both nations continue to remain close to each other. 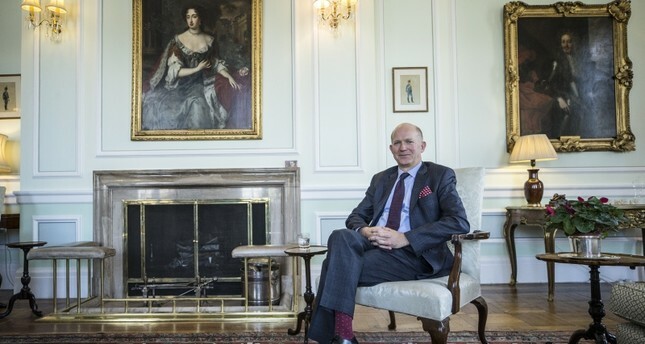 Another ambassador who embarked on the adventure to learn Turkish is the U.K. ambassador to Ankara, Dominick Chilcott. Noting that he began to study Turkish in the 1980s before he began to work in the U.K. Embassy of Ankara, Chilcott highlighted that he faced tremendous difficulties while learning the Turkish language due to completely different syntax rules in both languages; yet, he achieved an improvement to some extent. "Turkish language is a key to understand Turks. My personal opinion is that Turkish people on the street are very friendly people," he added. Sharing his interest in the language, Chilcott said that he is very fond of old idioms and proverbs. "Her yiğidin bir yoğurt yiyişi vardır," he quoted a proverb which can be literally translated as each brave man has his own way of eating yogurt. Kazakhstan Ambassador Abzal Saparbekuly is another enthusiast of the Turkish language. Stating that he came to Turkey in 1992 following the independence of Kazakhstan to learn Turkish, Saparbekuly said that they could learn the brotherly connection with Turkey after the Soviet Union was dissolved since there was no distinction of related nations. "Anatolian Turkish is so rich. If the forgotten words are revitalized and taught in the schools, it will both add further richness to Anatolian Turkish and facilitate the learning process of other Central Asian languages," he underlined. Saparbekuly highlighted that Kazakhs love Turks and cherish the brotherly connection with Turkey. "When I first came to the country, I didn't know any Turkish nor did the people around me know English or German. So, I had to learn Turkish as soon as possible because I could not even buy a loaf of bread. After three months, I was slowly able to speak Turkish with a bad accent and lots of mistakes," Viktor Matis, the Hungarian envoy said. When Matis first visited Turkey in 2005 as a volunteer, he began learning the language with the help of a Turkish friend during his 18-months stay. Expressing that he lost a lot of time while learning Turkish as he tried to understand the language with the logic of English language, Matis shared his discovery as, "If I tried to understand Turkish with the logic Hungarian language, it would be a lot easier." "There is a bridge connecting the two languages. They share the same language family. We also add suffixes at the end of words," he explains. Matis also talked about the interesting adventures he experienced: When he was in a restaurant, for example, he ordered his dinner with a perfect and detailed manner in Turkish, yet when the waiter returned to say there is no ayran. He struggled to explain in English. "I said: 'Brother, I almost spoke with you in Turkish for two minutes. Why are you telling me there is no Ayran,'" he said. Explaining the challenges he faced with Turkish people who realized his level of knowledge about the language, Matis underscored that just like Hungarians, Turkish people also feel instantly connected with foreigners who know their own langue and begins to speak very fast, assuming that the foreigner knows every inch of the language. Emphasizing that knowing the language of a country is very beneficial for gaining insight on the dynamics of that country Matis said that "If you view other countries as it was your country, you cannot get in touch in a serious and realistic manner. You can understand the culture and the people through language."